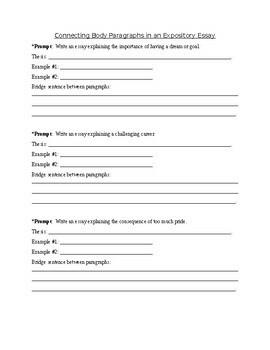 After reviewing the Tips on Connecting Paragraphs handout with students, have them complete the following worksheet and use the "Tips" handout as a reference. It provides 3 expository prompts, and students will create a thesis and list 2 examples they could use to support their thesis statement for each prompt. In order for the worksheet to be most effective, their thesis should be "open" or list only 1 reason. This will allow each of the 2 examples they list to support the same reason. They will then create a "Bridge sentence" that refers to their first example briefly and leads into their second example, as is demonstrated on the "Tips" handout.